You know, I love IMBB's and I'm always looking forward to each theme everytime they're announced. Just participating in an IMBB helps me understand so much about that particular theme especially after researching and discussing with a few people. Then the round-ups are so wonderful as I get to see and learn from the other bloggers their methods, tips and ideas in handling that particular theme. This month's theme, "tasteTea" which was introduced to us by Clement from A La Cuisine! really got me excited. Thanks to Clement for hosting and I love the idea of showcasing a few entries each day. Although I do drink tea on a daily basis, I have not thought much about using them in my food. I have only eaten once in a Chinese restaurant called Purple Cane which specialises in dishes made from tea but that was quite sometime back. All I remembered about that meal was the dishes were all light, refreshing and healthy. Thus I started hitting those recipe books and the internet to understand more about cooking with tea. During my research, I had some clear parameters on what I wanted to cook, it had to showcase chinese tea since that is my heritage and it had to have a healthy element which was the basis of drinking tea. Thus I settled on my trio of teeny weeny tea bites which uses jasmine tea and green tea. Tea smoking seems to be one of the popular methods used in tea cuisine. You can mix whatever you wish into the mixture to be heated up to create smoke. In this recipe, I adapted from Flavours magazine, the salmon is smoked over a mixture of brown sugar, rice and jasmine tea. Alternatively you can use green tea mixed with orange peel or oolong tea leaves in your smoking mixture. Anything can be smoked; chicken, duck, poussin, tofu, prawns and salmon. I chose salmon as part of the theme for my sampler menu was seafood for that light taste. Mix the marinade ingredients together and marinate the salmon fillets for four to six hours, turning at least once. Mix the smoking ingredients together. Line a wok with two layers of foil and place the smoking mixture on top of the foil. Lightly oil a steel rack with holes and place it over the mixture. Cover the wok and heat it until it starts to smoke. This should take about ten minutes. Place the fish on the rack. Replace the lid and wrap damp tea towels tightly around the edge to prevent smoke from escaping. Smoke the fish over a medium heat of ten to fifteen minutes or until cooked. To assemble the sushi: slice slivers of the daikon white radish with a vegetable peeler. Cut a piece of the tea smoked salmon. Cut a piece of seabass fillet sashimi (I used ready cut sashimi so I rolled them instead since they were quite thinly sliced. If slicing them yourself, cut it into chunks) Assemble tea smoked salmon on top of the daikon radish, add a bit of wakame at it's side. 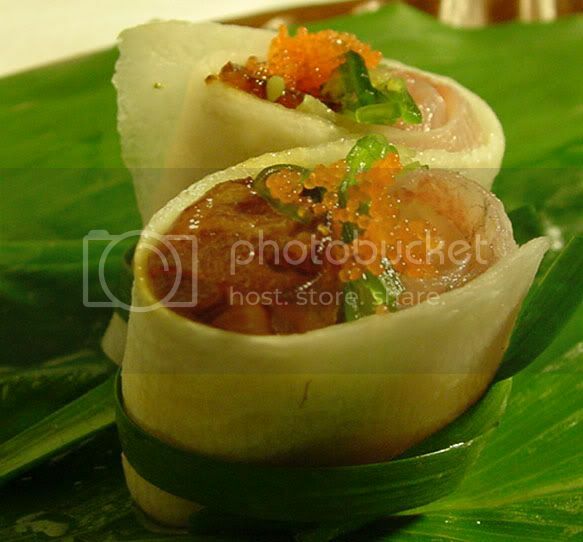 Place the seabass fillet next to the salmon and roll up the radish. You can tie it up using a piece of chive (soft part). Sprinkle some ebiko on top of the sushi and serve. I was inspired to make a green tea salt after watching one of Jamie Oliver's television shows where he made some rosemary and lemon salt. Not sure which episode it was but I remember he had an Elvis Presley impersonator over for lunch so he made the salt to go with chips. Initially I thought of a green tea and ginger salt but after I mixed up the ingredients, I felt the ginger overpowered the delicate smell of the green tea. Instead, I re-mixed another batch just solely made from green tea and it was aromatic and light. I had recently purchased a new cookbook, Simple by Jimmy Chok so I borrowed the idea for a wakame tart from him. In his recipe, he uses puff pastry but in my version, I cheated a bit and used a ready made pastry case. This was baked in the oven until it was hot and crispy, then sprinkled with some wakame and topped with a seared salmon sprinkled with my green tea salt. Grind one teaspoon of green tea leaves till a powder in a mortar and pestle. Add slightly than one teaspoon of sea salt crystals to the green tea. Grind the sea salt and mix with the green tea. Bake the pastry in an preheated oven at 180C for about 4 minutes. (If using ready made pastry case, follow the manufacturer's instructions) Remove and top with wakame. Return to oven and bake further until pastry is cooked. Season the scallop with the green tea salt. Heat the oil and sear the scallop over high heat. 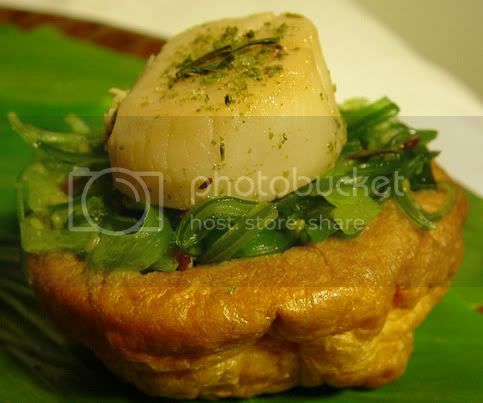 Place scallop on top of tart, sprinkle with some green tea salt and garnish with some green tea before serving. The last item on my tea bites menu was this delicately flavoured wanton. Made from finely chopped scallops and prawns, I had added some chopped up green tea leaves which was inspired after reading about a similar dish in Cooking with Green Tea by Ying Chang Compestine. The wanton was loosely based on a recipe for a prawn and scallop ravioli from my Simple cookbook. The broth to accompany the wanton was also infused with some green tea leaves. Make the chicken broth by boiling chicken bones, a few peppercorns, 1 bay leaf, 1 chopped carrot, 1 chopped stick of celery, 1 chopped onion for about two hours. Skim the surface of the stock to rid it of impurities. It is preferable you make the broth a day ahead so you the oil in the stock can rise and be removed easily. Before serving the broth with the wanton, add some green tea leaves into an infuser and boil it. This will give the broth a tinge of tea in it's taste. Infuse dried green tea leaves for about five minutes. Remove the tea leaves which will unfurl into small buds or leaves. 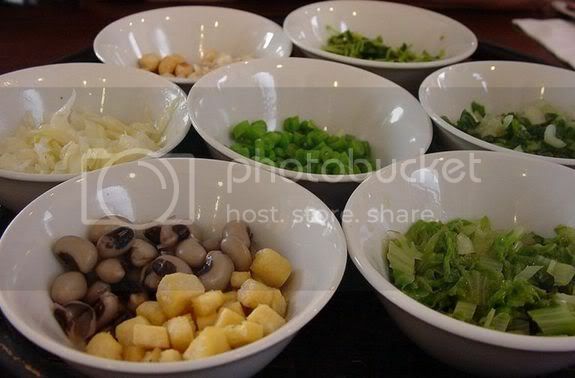 Chop them finely and mix them into the wanton mixture. Spoon a bit of the mixture on a round shaped wanton skin, fold them halfways to enclose the filling. 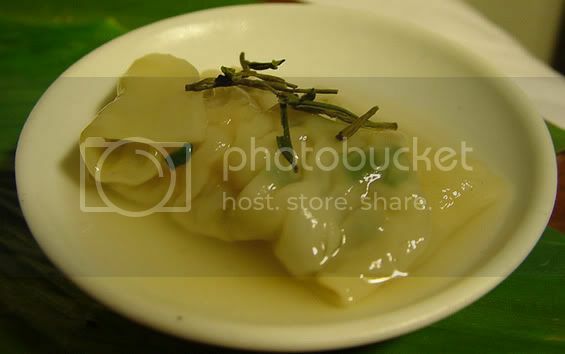 Poach the wanton in some simmering salted water and scoop out onto a bowl or a plate. Add a bit of the infused chicken broth on top and serve with a garnishing of green tea leaves. In this month's Is My Blog Burning? (IMBB) hosted by Clement from A La Cuisine! all the way in Toronto, besides creating a tasteTea dish with any type of tea, he has also asked us to blog about tea rituals. Since I am part Hakka (my father's side), I decided to talk a bit about the famous Thunder Tea Rice (Lui Cha Fan) that is unique to the Hakka clan. The Hakka clan is said to originate from the Northern China provinces of Shanxi and Henan. However due to war and chaos, they were forced to migrate to Southern China. During their migration, they had to go through a lot of hardship and were not welcomed in new settlements. However, the clan people were a practical lot and endured the hardship and never had any qualms of grabbing an opportunity for a better life. This led them to be called "guest (Hak) people (Ka)" since they were often guests of new settlements. I guess that is probably why my grandfather migrated to Malaysia from Southern China as he wanted to search for a better life. Unfortunately he died when he was very young leaving the family to be taken care by my grandmother. She had a mammoth task looking after thirteen children during those days but like my dad always said, she was a typical Hakka woman who was strong and could deal with anything. 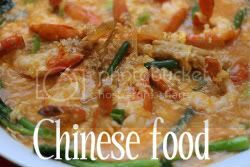 Hakka cuisine is said to be quite "rough" or unrefined to be fashionable but nowadays, you see quite a number of establishments selling typical Hakka dishes like yong tau foo where they stuff fish meat mixed with ground meat into vegetables or bean curd. 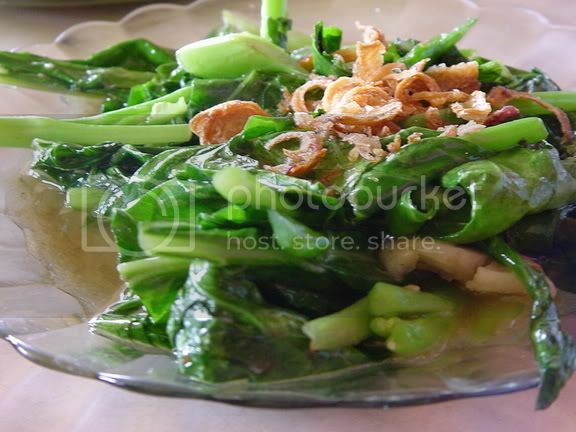 They also use a lot of preserved vegetables in their dishes as nothing is to be wasted during those hard times. I will be blogging more about Hakka food next week as I visited a Hakka restaurant recently. 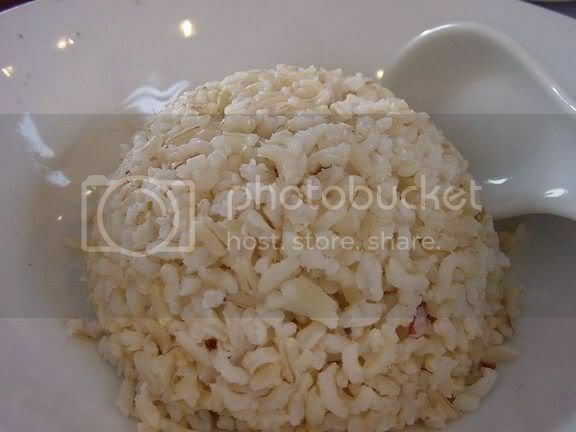 In the Hakka clan, there is a sub-group called Ho Poh and they have a unique tradition in this Thunder Tea Rice (Lui Cha Fan). The thunder created is said to signify the noise made when one is preparing the dish which involves a lot of grinding of tea leaves and chopping vegetables and nuts to small bits that accompany this dish. Traditionally, the Ho Poh eat this dish on the seventh day of Chinese New Year. This particular dish seems to have quite a following due to it's healthy nature and besides restaurants specialising in Hakka cuisine, you can find it in organic restaurants. My lui cha fan below is actually from an organic restaurant called Ecogreen, located in Bukit Kiara. The ingredients are all organic and totally healthy. The lui cha fan comes with seven condiments of tofu, groundnuts, pickled radishes and various vegetables which are all chopped up in small bits. To maintain the health perspective of this dish, brown organic rice was used that is steamed so it's fluffy and soft. 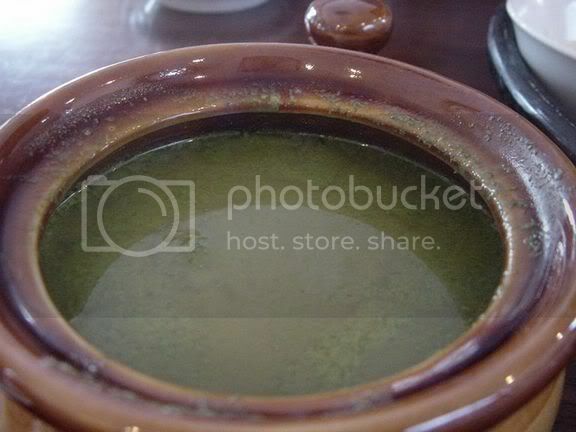 The tea part is in the soup which is brewed from a mixture of tea leaves, basil and mint. The mixture is grounded in a lui cha pot till it becomes a paste. Then it is wrapped in a cloth and infused in hot water to produce this tea. The tea is served piping hot. To eat your lui cha fan, you pour the condiments into your rice and add the hot tea. As it is an acquired taste (some say the tea can be too bitter or taste funny), add as much as you like. 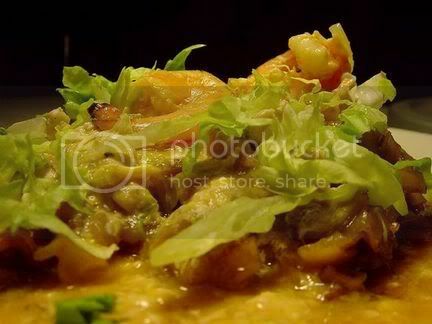 The dish can be quite filling even though it does not look it and you can omit the rice if you wish. It's the weekend again and kitty time! This time round, I thought I will feature the kittens who came to visit from next door. My neighbour's cat recently had a trio of ginger kittens who all look alike except for slight variations to their tail, spots and stripes. 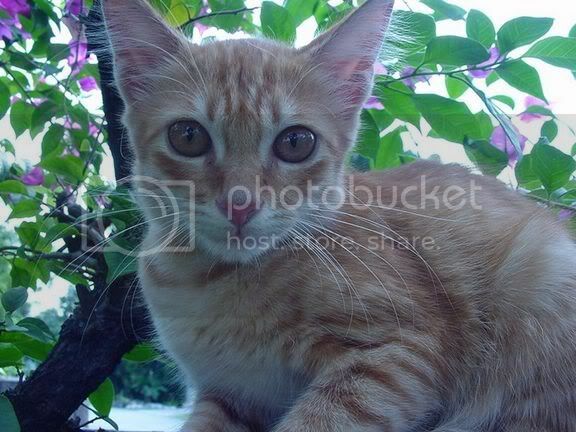 A favourite nook for one of the kittens is on top of the wall just directly under the bougainvillea tree. The kitten loves to stretch and sleep under the shade waiting to see who comes to the house. Kinda like a guardhouse kitty! 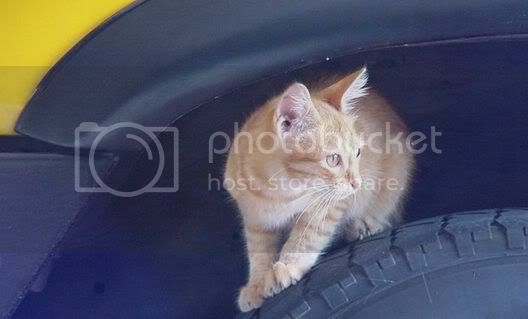 This naughty kitten decided that climbing up a big tyre would be great fun. Earlier, it was actually sleeping on the tyre but we couldn't catch that as it woke up just when we wanted to snap it. If you want to join us for the weekend cat blogging, send me your link and add a tag called weekend cat blogging for your post. This is the classic Malaysian dessert that everyone loves especially on a hot day. 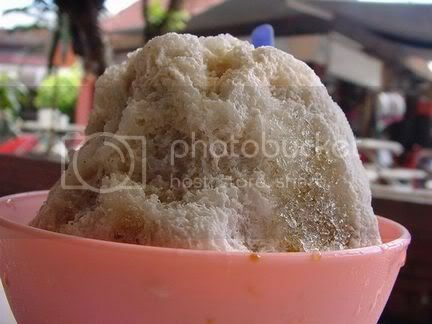 The Ice Kacang (Malay for Peanut Ice) is also known as an ABC aka Air Batu Campur (Malay for Mixed Ice). Essentially, it is a mound of shaved ice packed on top of a mixture of sweet red beans, toasted peanuts, creamed corn and jelly bits. The ice is flavoured with syrup and a mixture of evaporated and condensed milk. Like any classic dish, there are so many versions as you can vary the syrups, milk and the mixture according to personal taste. 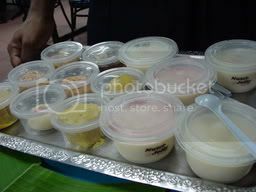 Some interesting combinations I have tasted and seen are; sliced bananas in Penang Swatow Lane's version, a scoop of ice-cream to add creaminess to the dessert, sweet Atap Chee (sugar palm seeds) and pureed durian flesh for those who want a bit of adventure. 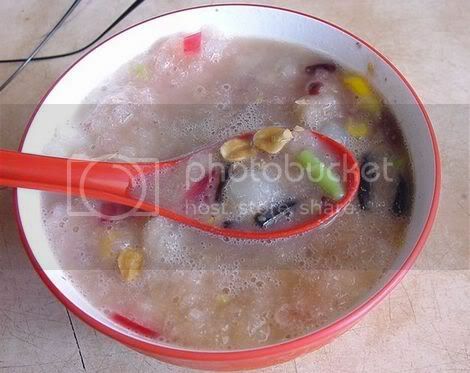 Throughout Asia, the dessert is also known as halo-halo in Phillipines, ruam mit in Thailand and three bean drink in Vietnam with a combination of toppings and syrups to suit local tastes. Usually the ones you get have lashings of red rose syrup and milk but I am partial to the kind that just uses the brown palm sugar syrup and a splash of evaporated milk like this one below which is found in the old Medan Selera, Petaling Jaya. The shaved ice is so fine that when you put it into your mouth, it melts to give you a creamy and ice cold taste. There are two ways to eat your Ice Kacang, you can eat just the ice first savouring the creaminess just like how I do it. Alternatively, you can mash up the ice into the mixture so everthing is mixed up as seen below. For me, I do both; eat the ice until the top of the bowl, then mash it in so it becomes an icy soupy dessert with yummy bits inside. This version has toasted peanuts, some green cendol bits, red jelly bits, sweetcorn, bits of grass jelly (cincau) and sweet red beans. * There are two stalls serving this version in the Medan Selera, the other one is at the opposite side of this stall and they both flank the chicken rice stall, Kie Kie. This stall's quality of shaved ice can be erratic especially when the old man is not around to serve it. For a more consistent one, you can try the opposite end's stall. After writing and reading up about all the Indian sweets for this entry, I think my poor blog is now suffering from the ultimate Sugar High! I started my last post talking about the savoury part of my Sunday, here's the sweet and toothaching part. Besides serving savoury dishes, Lotus Family Restaurants also have a wide variety of Indian/Punjabi sweets and crispies like muruku and etc. I have tried to identify these sweets based on some websites and from discussions with the people from Lotus. I hope I got it right as I am no expert on Indian sweets but if not, do drop me a comment and I will amend the posting if it's wrong. The sweet counter display is right in front of the shop so you're lured to these jewel like sweets from the main road of Jalan Gasing. Usually these sweets are for festivals but occasionally people buy them for snacks or dessert. 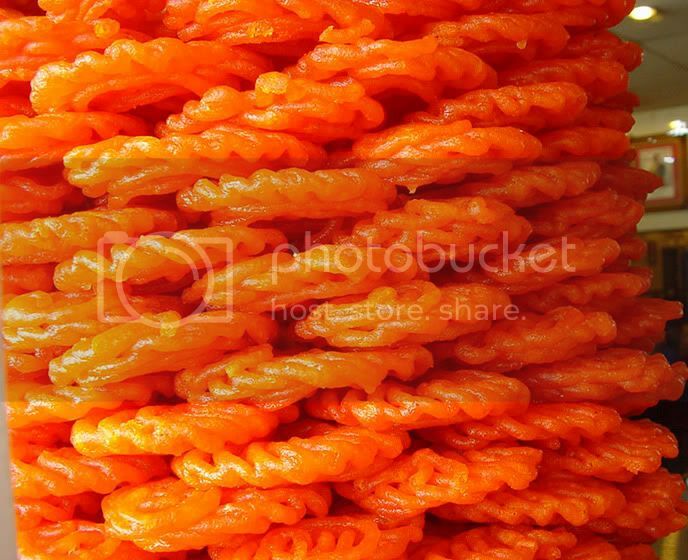 This stack consists of glistening bright orange Jalebi. 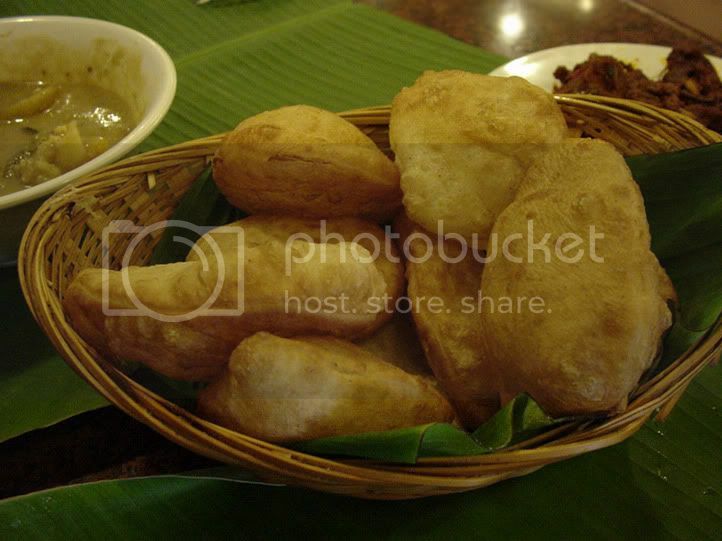 These sweet crispy round whirls are made from maida (Indian for plain flour), besan (Indian for gram flour) and water. The batter is deep fried in ghee (Indian for clarified butter) then dipped in a sticky sugary syrup. You can either infuse the syrup with some saffron threads to get a subtle colour. If you want to achieve this brilliant orange, you will need to add a few drops of red and yellow colouring. 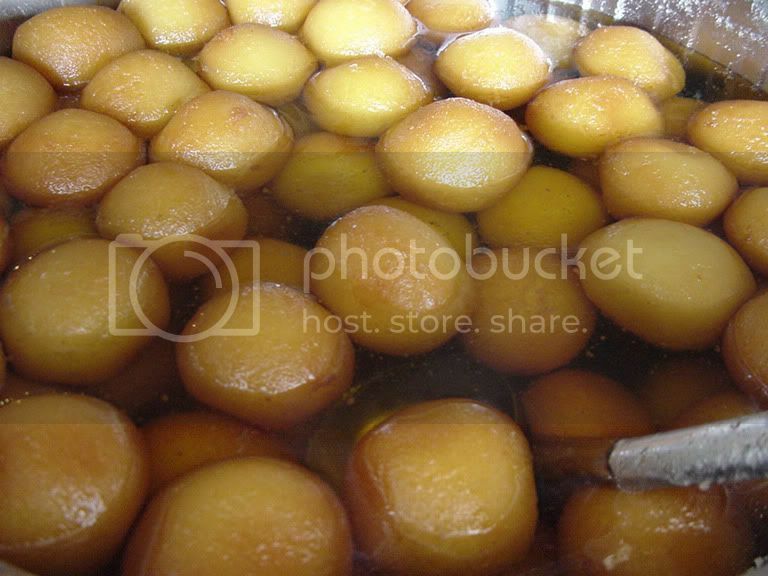 These powdery light brown balls are known as Ghee Balls. 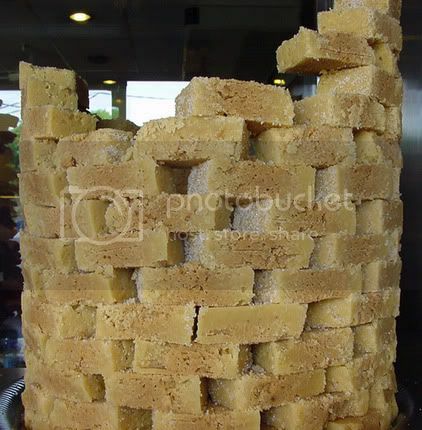 It's usually made from finely grinded roasted cashewnuts, flour, ghee and sugar. Pop one ball into your mouth for that melt in the mouth sensation. 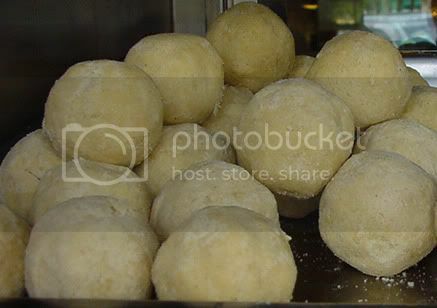 The Malays have a similar dessert that is usually served during their Hari Raya celebrations called Kuih Makmur that is made from roasted peanuts. This balls are known as Gulab Jamun, another popular Indian dessert. Made from milk and flour, these balls are fried in ghee and served with a syrup flavoured with cardamon seeds and saffron. 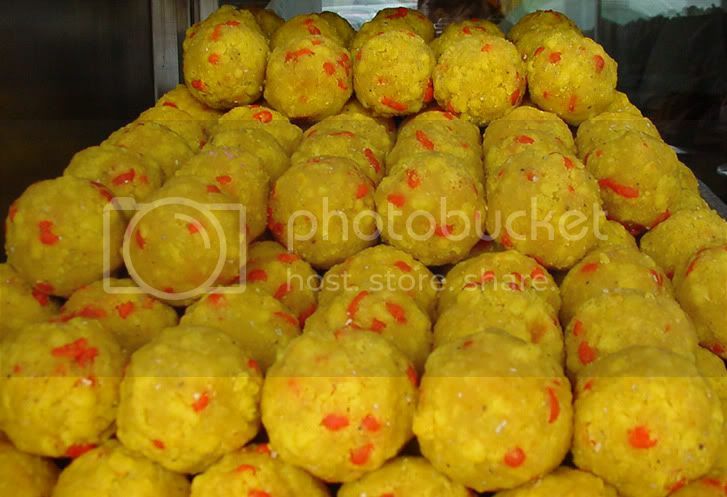 The next dessert is laddu that is usually made from gram flour, rice flour, sugar, ghee and cashewnuts. It's a popular dessert for Deepavalli when sweets are usually served in the hope that the year ahead will be sweet and happy. Traditionally the Indians will start making the sweets for the festive season after the Navarathiri, a nine-day fasting, which takes place exactly twenty eight days before the festival. Usually they will start on the tenth day as it is an auspicious time to start making the sweets. According to Lotus, this is Paalgova/Paal kova which is made from evaporated milk and sugar. This milk is slowly boiled until it is thickens then poured into a mould. Once cooled, you can cut them into shapes. The texture is crumbly and totally melt in the mouth. This is Halwa made with bits of almond, cardamon, sugar and milk. 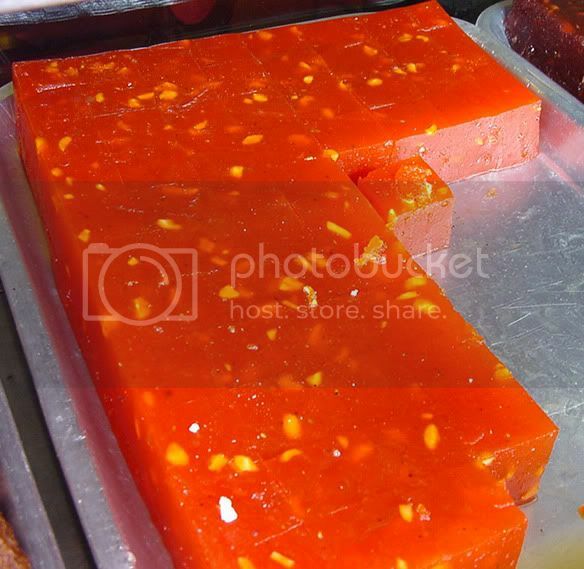 Ghee is also added into it and you can colour it with saffron or orange colouring. 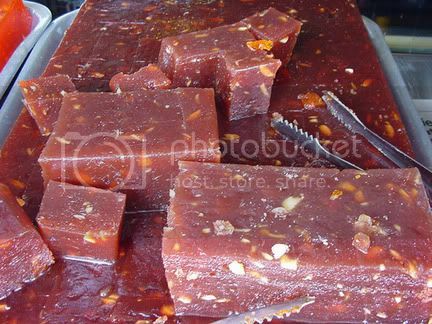 There are different varieties of halwa, this one uses dark brown sugar and cashew nuts. 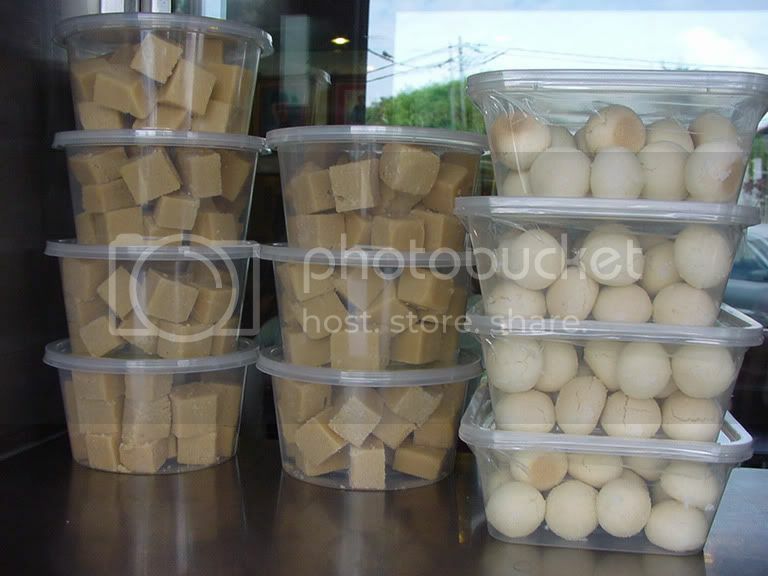 The plastic containers on the left is Khoya Barfi, a fudge like dessert made from khoya. Khoya is usually made at home by boiling and reducing the milk to a solid state. 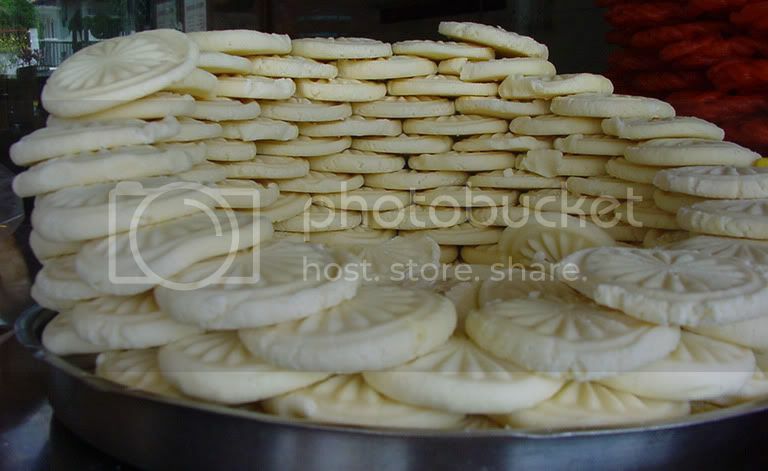 The biscuits on the right are made of sugee or semolina flour. 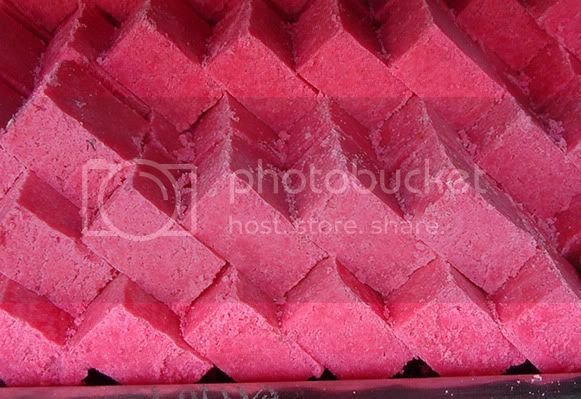 I usually get the Khoya Barfi, one of my favourites and surprisingly my cat, Kits loves them! Guess it's not strange since it is made from milk and cats are supposed to love milk. This is Lotus' coconut candy, all pretty in pink. 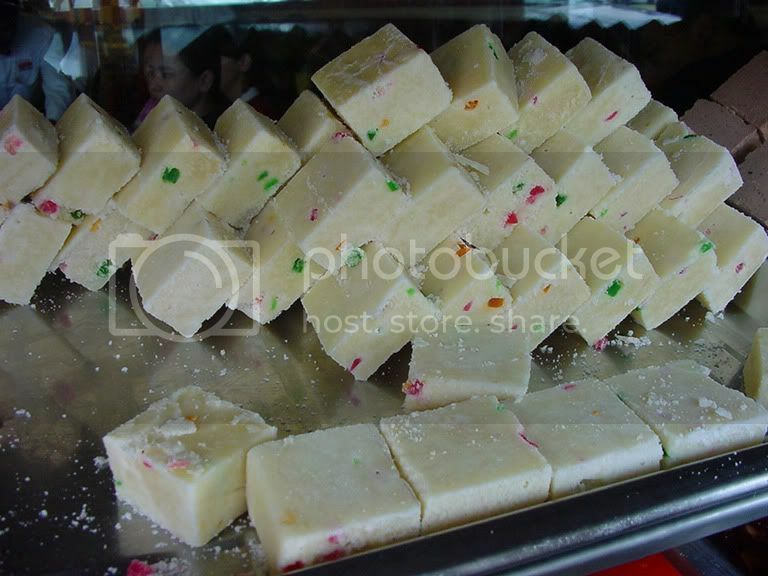 These candies are usually made from evaporated milk, condensed milk and freshly grated coconut. You can add different colourings and flavourings when making your own at home. Usually they make pink, green, plain vanilla or chocolate ones. These are all the different kinds of Barfi they serve at Lotus. You can make them out of any ingredients including vegetables! The one below is just a plain milk one. Sometimes for festivals, they will decorate them with silver foil. This barfi is made from cocoa powder and chocolate bits inside it. 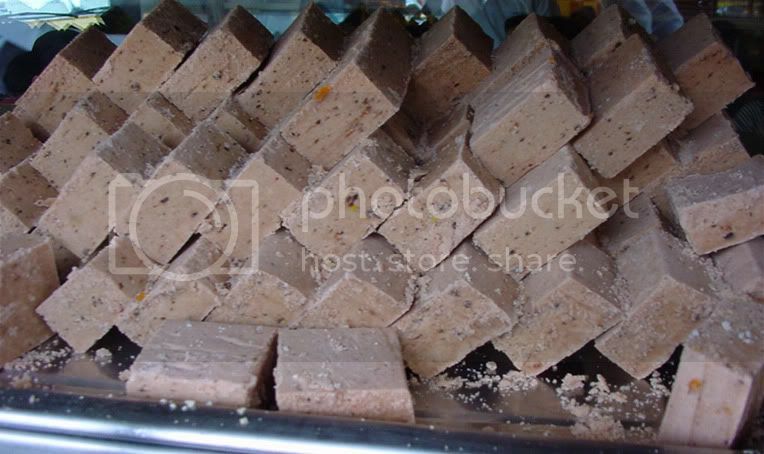 This is barfi studded with some dried fruits. Don't they look pretty with those red and green bits peeking out from that creamy fudge like dessert. I love the way they stack up these sweets, reminds me of building Lego! 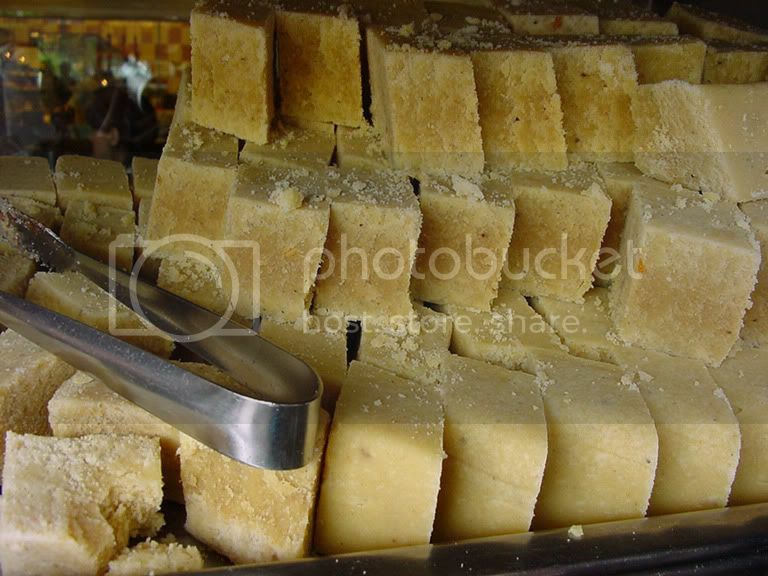 This is plain barfi dusted with crunchy caster sugar. 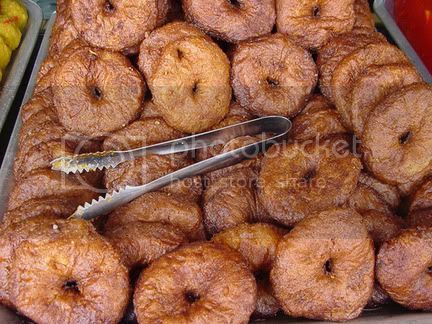 I am not sure what's the Indian name for this but Lotus told me that this doughnut like sweet is made from brown sugar. 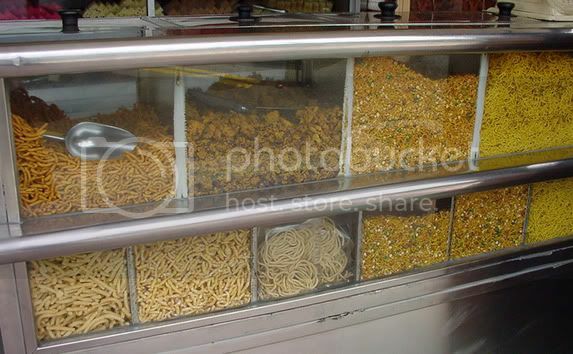 Besides sweets, Lotus also sells a variety of Muruku and crispies. Will probably blog about that another day once I get someone to explain to me the different varieties. Last Sunday, we explored the savoury and sweet tastes of Indian/Punjabi food at Lotus Family Restaurant in Petaling Jaya. The Petaling Jaya suburbs especially the Old Town section is peppered with Indian restaurants serving banana leaf rice during lunch time but this is the only place we know that serves Bhatura. After searching through the Internet, I understand the Bhatura is a Punjabi snack. Essentially it is a deep fried unleavened bread made from unbleached white flour and yoghurt. If you want to make this at home, have a look at these curry addicts' website as they give detailed instructions on how to make it. There is also a step by step video. Both of us had the Bhatura with some dry chicken curry and vegetable kurma. There was so few vegetables in the kurma that it looked more like kurma sauce only. The chicken was also nothing great. Bit dry and not much flavour to it. Sorry about the slightly dark pictures as the place was quite dim. I just realised that the haloscan comments is openning another pop up window from this opm.blitzed.org website which is banning some IP addresses! I suspect this must be some stupid bug that has attached itself on haloscan as I definitely did not install that. No indication on the haloscan website also about it. If any of you know how to get rid of it, please email me at boo_liciouskl@yahoo.com so I can fix the problem. Pending all this, I have re-activated blogger's comments so please post your comments there. Thanks and hopefully I can resolve this without losing my old comments. It has been raining off and on in Malaysia so I am still in the soup mode. Recently I made this new soup which is a variation of my usual white radish and chicken soup. In addition to the white radish, I added some green radish and carrots. The idea for this soup originated from my mother who drank this version in Hong Kong. 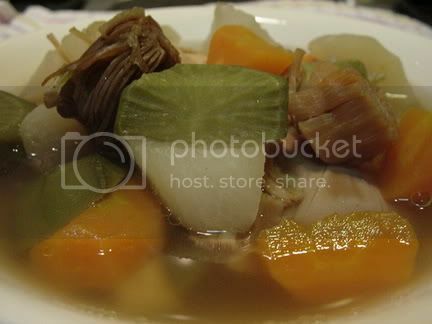 Trawling through the internet, I noticed that there are various interpretations of this soup also; Kuali has a similar one except they add burdock to the mix while Kitchen Capers' soup is a mix of green radishes, carrots and herbs. Instead of red dates, I used one honey date (Mat Chou in Chinese) to add to the soup to make it sweet. You can get it at the Chinese medicine shops and make sure you choose the ones without the additional sugar coating. Don't use too much of it or else your soup will be too sweet. The honey date is said to help clear the phelgm of someone suffering from a cold. You can see the honey date on top but it's a bit mangled after being boiled for two hours. The soup was lovely, sweet enough to just drink without any additional salt. It made a wonderful one pot meal with some white rice. I added some dried scallops to the soup but you can omit them if you don't want your soup to be too sweet. Cut the top and bottom bits of the white radish, green radish and carrot. Peel the outer layer of the vegetables by using a vegetable peeler. Cut them into chunks. Set aside in a large pot. Boil water and pour it over the chicken legs in another pot. This helps clean out the oil and scum from the chicken. Leave for 2 minutes and drain. Transfer the chicken legs to the large pot with the other vegetables. Add the dried scallops and the honey date. Pour enough water to cover the ingredients. Boil the soup and let it simmer for two hours. I am definitely going through a Sarawak food phase but don't worry, this should be the last posting on all things Sarawakian. Recently, we were down at the tourist area of Jalan Bukit Bintang as Splashie Boy wanted to go check out some IT gadgets in Low Yat Plaza. Both of us rarely walk around that area and so many things have changed! The stretch of road between Bukit Bintang Plaza to Federal Hotel is now peppered with foot reflexology centres and Middle Eastern restaurants. Wonder whether those centres are a front for some other hanky panky stuff since that area is a notorious red light district. I had read about the Sarawak, Paradise in Borneo centre from the papers, so I was keen to look for it and try their food out since we were in that area. After walking through the foot reflexology area, we finally found it just after Federal Hotel. 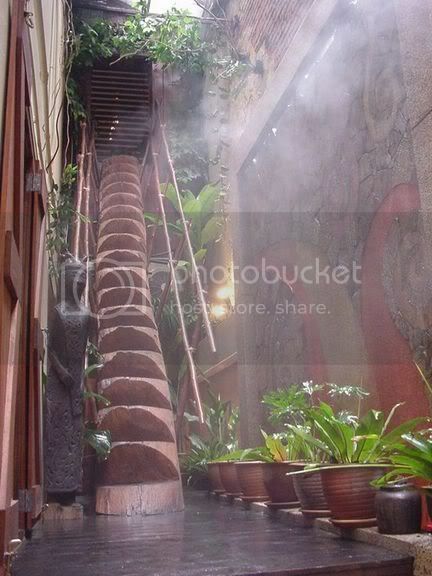 The shophouse is niftly designed as every nook and corner is used to house a handicraft shop in front, an area where they display how they weave those baskets that Sarawak is famous for, a tourist centre and the cafe which is at the back. The cafe serves Sarawak delicacies so you get a taste of the different kinds of food that they serve in Sarawak. I made a beeline for their Sarawak Laksa, my absolute favourite. 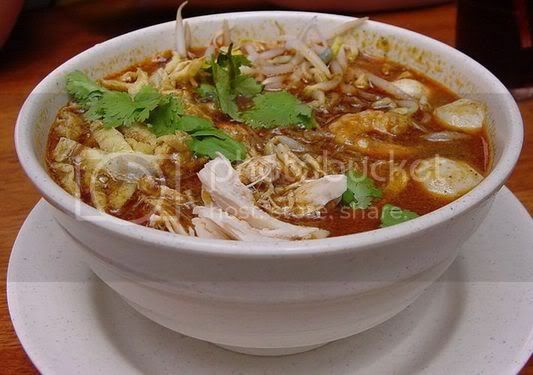 The laksa is made from a paste made in Sarawak (it seems no one actually knows the way to make it as people in Sarawak just buy the paste) and coconut milk. Vermicelli noodles (beehoon) is used with prawns, shredded chicken, omelette strips and bean sprouts as toppings. The laksa was yummy, I liked the soup as it had the right touch of creaminess from the coconut milk (not too heavy or light) and they also gave you a real killer belachan (Malay for dried shrimp paste) sauce to go with it. My only complaint was the prawns were too small and they added fish balls in the laksa. I don't think I have ever eaten fishballs in laksa before but the lady serving us claimed that this is what the Sarawakians now add. Splashie Boy had the Foochow Fried Noodles which was served in a small wok. 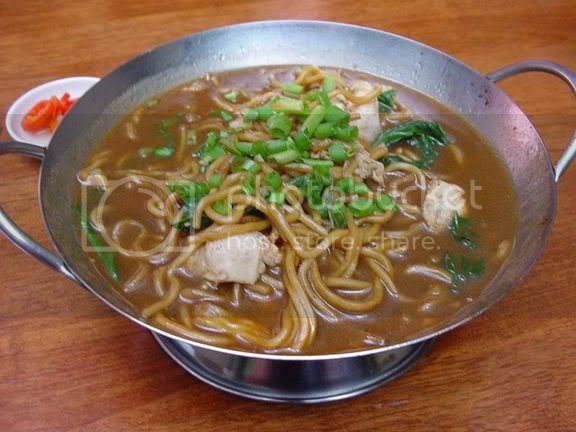 The yellow noodles are fried first before cooking them in the gravy. Kinda reminds me of a Hailam Mee dish. The noodles were okay but I am sure it does not taste as nice as the ones served in Sarawak. Yippee, it's the weekend and the cats will be taking over this space. (sorry no food postings until Monday as the kitchen is closed!) Poor kitties, they were all so shell shocked last night as there were fireworks nearby. All of them ran helter skelter to avoid those large boom boom sounds. Luckily it was on for a short while and life continued normally after that. 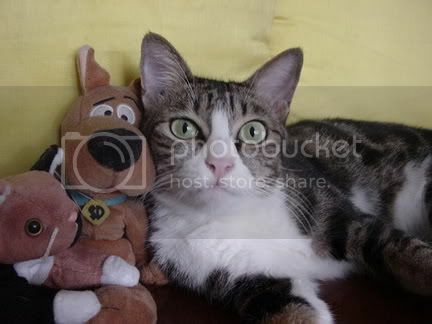 This is Ally with her soft toy friends aka Scooby Doo and Beanie Cat. She loves to lounge at this wooden long chair with the silk cushions and her friends. I picked her up as a stray when she was just a wee little kitten and she has been a bundle of fun since then. Initially she used to stay with my dad but now she has decided to live with me and the other two rascals. Unfortunately she does not get along with Kits who sometimes teases her mercilessly. Occasionally they'll chase each other around the apartment just like those Indian movies dances till they are exhausted. Here's Ally looking all tired out from her "photo session" and basically giving me her buzz off look that says go away as I want to sleep! Do join us for the weekend cat blogging if you have any gorgeous pictures of your kitties by sending me a link to your website in the comments box. 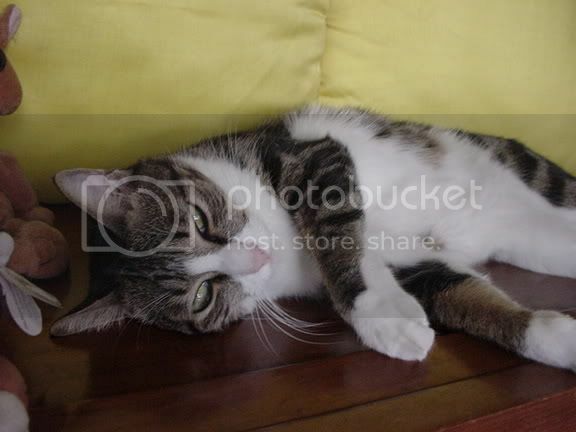 Clare from Sydney has posted her cutie pie, Kiri's pictures when he was small and Farmgirl from Missouri has an interesting story about the cute and innocent looking Molly. Farmgirl has also put up pictures of Gretel while Barbara from Ohio has a bed full of cute cats. Dagmar and her lovely cat, Tanuki from Sweden has just joined us and we hope to see and hear more about her cats in the future. More new entries this weekend, Mrs. D from Washington's Belly Timber joins us with a picture of her mighty fierce kitty. I have been lucky that I have travelled to almost everywhere in Malaysia for work and holidays but two states that I have yet to visit are Sarawak and Perlis. Not sure why but I am totally fascinated with Sarawak since I have not been there. I guess it's because I love the food they have there especially their laksa (More on that in later postings). So when Flavours did a feature on Sarawak food, I was so happy that I decided to try this interesting combination of adding tomato sauce to their fried kuay teow (rice noodles) dish. Splashie Boy and I like the normal Cantonese Fried Kuay Teow, fried kuay teow with an eggy gravy and chicken shreds with mixed seafood. The Tomato Kuay Teow is just like the Cantonese Fried Version except they add some tomato sauce. I omitted some ingredients as I cooked up whatever I had in my fridge which meant no choy sum and squid while I replaced the iceberg lettuce with some baby butterhead lettuce. The recipe called for tomato sauce and I added tomato ketchup which was what I had in my larder. Thinking back now, I think I should have added tomato puree or some whizzed up tomatoes instead which will give more flavour to the noodles. The verdict after testing the food was the noodles were nice and kinda unusual with the tomato sauce. As I added ketchup, the tomato flavour was not too strong and complemented the noodles quite well. Looks like I will just have to be contented with my version on this pending my visit to Sarawak to sample the real thing. Combine the kuay teow with the soya sauces and the oil. Mix well. You can drain the oil from the kuay teow by leaving it in a sieve for a short while when you're slicing the other ingredients up. Over high heat, fry the kuay teow for about two minutes. Dish out and place on a serving dish. In a wok, bring the chicken stock to boil. Add the prawns, squid, chicken, choy sum and tomato sauce. Bring back to the boil and add the cornflour mixture. Mix well and when the mixture thickens, season to taste with salt and pepper. Add the egg and stir to break it slightly. Pour gravy over the fried kway teow and garnish with shredded lettuce. Once in a while, we indulge in some banana leaf rice with Splashie Boy's friends, Mr. G and Mr. KS and the place we always go to is Kanna,Petaling Jaya. It used to be their lunch hangout but since everyone has shifted, it is now the meeting point for dinner. In Malaysia, the Indian food we usually get is from South India as the Indians migrated to Malaysia during the colonial times to work at the rubber plantations. Being a multi-cultural society, their food has become part of our landscape. 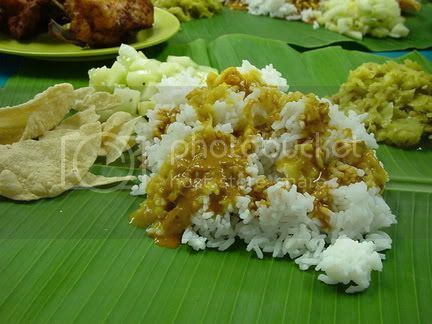 Usually banana leaf rice is served from lunch time onwards. It resembles a buffet of all sorts where they will place a banana leaf on your table as your plate. Then the waiters will start doling out the food, first comes the fluffy white rice and the daily vegetables. They are usually quite standard such as diced cucumbers and pineapples, cabbage or spinach. You also get some crispy poppadums with your meal. 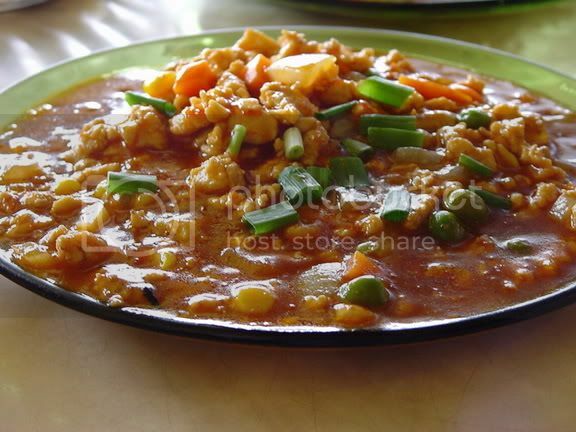 They will also serve you a variety of curries and dhall that is poured on top of the rice. To accompany your meal, you can order some deep fried food to go with it. Usually the ingredients are all pre-marinated and you will just pick whatever you fancy. Depending on each restaurant, they usually have chicken, fish, fish cutlet, quail, cuttlefish, crab, fish roe and etc. They will deep fry it and serve it to you. You can also choose to have some pre-cooked curries with your meal and to round it up with some dessert of jellies and Indian sweets. Incidentally when I started taking pictures of the food, the waiters all got super enthusiatic and kept coming up with these platters asking me to take their pictures! 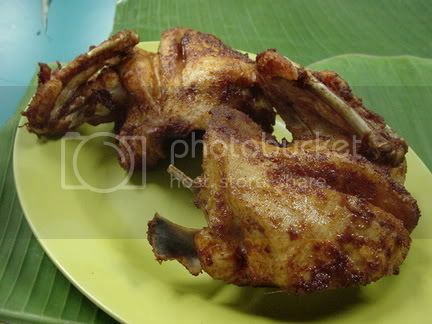 This is one of my favourites, the Sotong Goreng (Malay for deep fried cuttlefish). 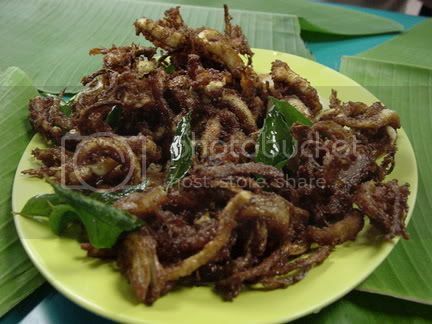 It's cuttlefish mixed with cut onions, chopped chilli padis (small little chillis) and curry leaves. 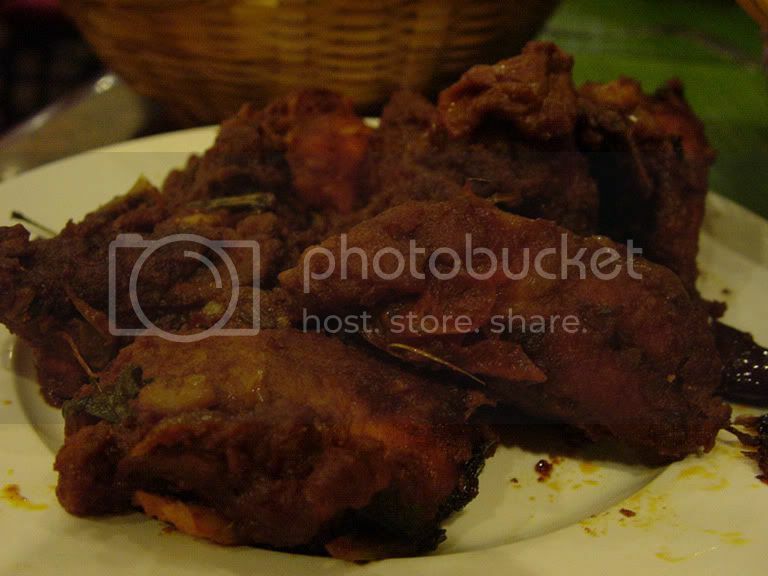 This is the standard order for us, the Ayam Goreng (Malay for deep fried chicken) which is marinated in their special sauce. Here's the banana leaf, full of rice with curry and the vegetables are in the background. See the yummy poppadums at the side. They also serve a soup called Rasam which is quite sour to accompany the food but we usually don't take it. It's supposed to help you digest your food. Once you are done with your food, all you need to do is fold your banana leaf into half. There is a way you are supposed to fold it, you fold it towards you or away from you depending on how satisfied you are with the food. Not sure which way is the right protocol though so maybe someone can enlighten me on that. Usually people eat their rice with their hands but you can also eat it with a fork and spoon. Whenever we go to the pet shop to stock up the kitties' essentials, we always pass by this restaurant and wonder if it is good since it always appears packed. So one day, I managed to get Splashie Boy to try the food. Now we know why that place is always full of people, the food here is good and very reasonably priced. We had a meal with dishes (small portion) and white rice and it was about RM20 including drinks. Looks like this will definitely be a place we will come back again and again for the great food and prices. This place serves some unusual drinks and I tried their Santai Special. 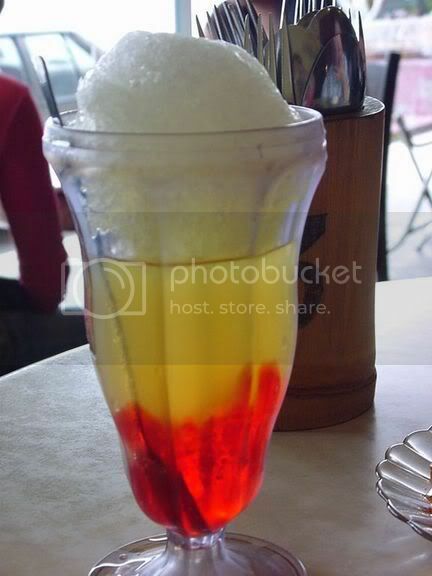 The red bits at the bottom are soft jelly bits while the yellow part is Kickapoo, a fizzy drink unique to Malaysia. This is topped by some finely shaved ice. Nice cool drink to tackle the heat. 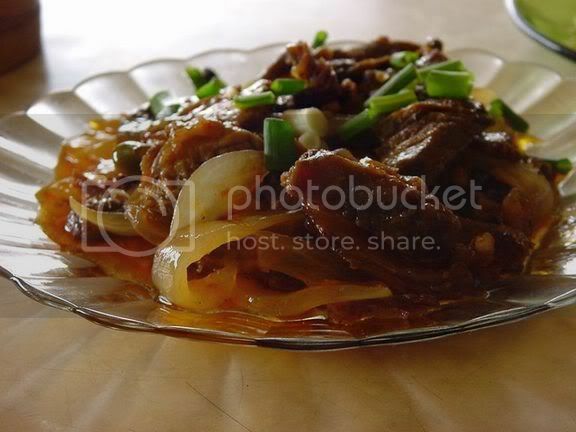 This is the Daging Masak Merah dish, I am not sure about the translated name but it is sliced beef fried with onions and chillies with a tomato sauce. 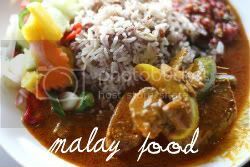 It's quite a standard Malay dish and in most places, you can order fried rice with daging masak merah as a one dish meal. 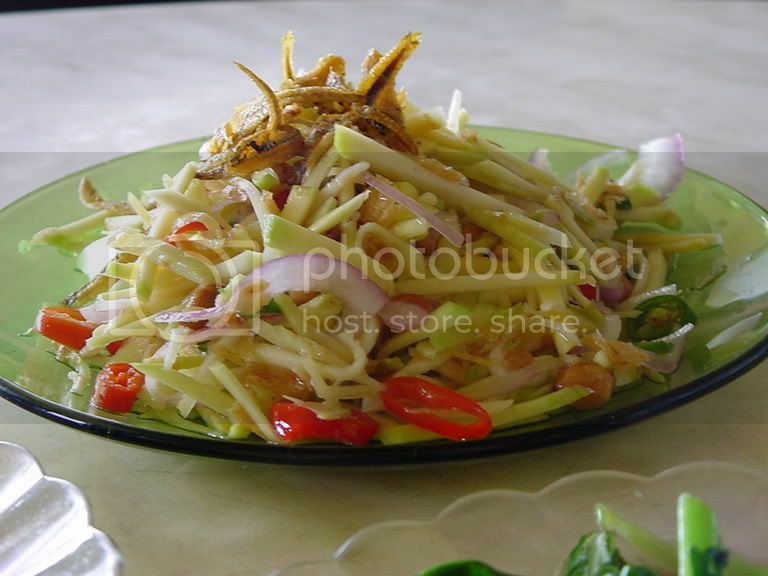 This is the Thai dish, Kerabu Mangga (Malay for Mango Kerabu). You notice that in most Malay restaurants, there are some Thai influences especially those who come from the northern states that share the border with Thailand. Similarly in the southern Thailand, there are also quite a number of Malay food stalls at the rest areas and the towns. Kerabu is mainly a salad and you can a few varieties like the papaya or even pomelo ones. This version has sliced young mangoes, sliced onions, chopped chillies tossed with a tangy sauce, fried anchovies and peanuts. I liked the dish, it was nice and crunchy and the dressing was not too sour. We also ordered the Kai Lan fried with salted fish. The kai lan was crunchy and the saltiness of the fish paired quite well with it. This is Telur Bistik which I had blogged about earlier in my eggs-perience entry. It's also another of those Thai influenced dishes that Malaysian hawker have added to their menu. In this restaurant, they do a slightly different version which is less spicy. It's a fried egg topped with minced chicken and a tomato sauce. Very nice and more-ish. Recently I got this month's edition of Flavours, the locally published food magazine and wow, was I blown away by the stuff they had inside this edition. They had the low down on Sarawak food which looked so good that it got me hankering for Sarawak Laksa, wonderful ideas to use caramel and this tiny booklet full of Malaysian desserts that were fanciful and unique in conjunction with the Malaysian Food and Fruits Fiesta. I was eager to try this fruit compote as Splashie Boy loved the picture of it in the magazine when he first saw it on the newstand. It is just a simple compote, nothing brilliant but I love the simplicity. Very nice and cooling especially when those tropical nights come back. It's up to you to mix whatever fruits you like, I used a variety which we like and whatever I had in my fridge; mango, dragon fruit, honey dew and jambu air (Malay for water apple). The original recipe actually uses 50 grams each of watermelon, honey dew, musk melon, strawberry and mango but I have adapted the recipe below. 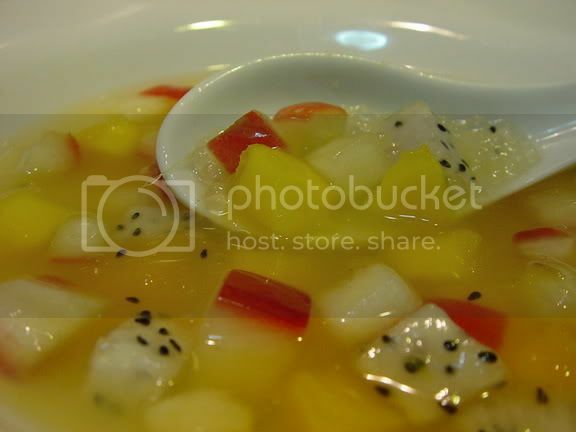 Sago pearls were used but I reckon you can also use those nata de coco cubes or agar-agar cubes (as suggested in the booklet) to make this compote if you wish that would give it a crunch. If you have a melon ball scoop, use that as the dessert will look more impressive. In the absence of that gadget, I diced my fruits instead. For the ginger syrup, I added about six slices of ginger as we love the extra gingery taste. Cook the sago by boiling it in plenty of water for about ten minutes. Turn off the heat and cover the pan. Allow the sago to steep for fifteen minutes until the pearls are translucent. Rinse in several changes of cold water. Drain. Boil together all the syrup ingredients. Remove the ginger slices and cool before using. In a mixing bowl, combine all ingredients and let them infuse in the refrigerator for two hours. Serve cold with ice cubes or shaved ice. Nic from baking sheet has posted the round up of entries for SHF 10, the Honey edition and what a sticky and yummy-licious list it is. I reckon Winnie the Pooh will approve of all of them. Thanks so much for organising Nic, it was a wonderful event. Can't wait for the next SHF, I think I am hooked on these sweet things. Recently the days have turned out to be rainy and slightly cold (compared to the usual tropical heat) that I had an opportunity to make some soup. The Chinese love to drink soup especially those double boiled ones with lots of Chinese herbs as it is meant to be good for your health. Although we love to drink soup, I don't make it all the time as we get loads of leftovers if I make one batch and sometimes the weather is just too hot for soup. 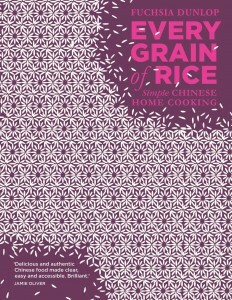 My soups are usually chock block with ingredients which we will just eat as one meal with rice. When I was a kid, my mother used to make soup most of the time so I grew up with some favourites. One of them is this Old Cucumber and Chicken soup which is pretty standard fare in most Chinese families. The old cucumber has an orangy brown skin and is used mainly for soups. Soups are always the easiest to make as it just involves throwing in some ingredients and boiling them for a few hours. One way to guarantee success in your soup is to pepper it with yummy ingredients like dried scallops and red dates. Some families use dried cuttlefish instead of dried scallops to flavour the soup. Usually these soups have enough flavour that you will rarely use salt to season them. This soup is good for your lungs, blood and your eyes so not only do you get a simple meal, it's also nutritious for you. Remove the skin from the chicken legs and trim off the fatty bits. This is important to ensure that your soup is clear from oil. Cut the old cucumber into half. Scoop out the seeds. Cut the cucumber in small pieces leaving the skin intact. 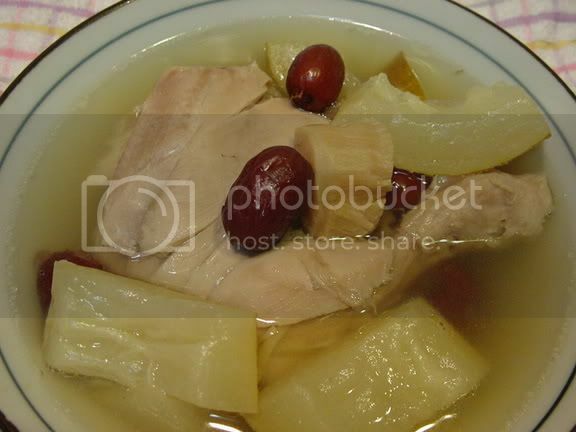 Put the chicken legs, chopped old cucumber, dried scallops and red dates in a soup pot. Add enough water to cover. I usually add hot water from a kettle to speed up the process. Leave to boil, then turn down the heat and let the soup simmer for about two hours. You may find the chicken legs to be too soft if you boil it for three hours. The best way to prevent it is either use free range chicken like Kampung Chicken or don't add your chicken for all the time i.e. maybe for only one hour instead. Turn off heat and ladle to bowl. This feeds two adults as a main meal with some leftover soup and cucumber for one person.